We are back with the 9th Annual Grapes on the Green at the Oasis Championship! 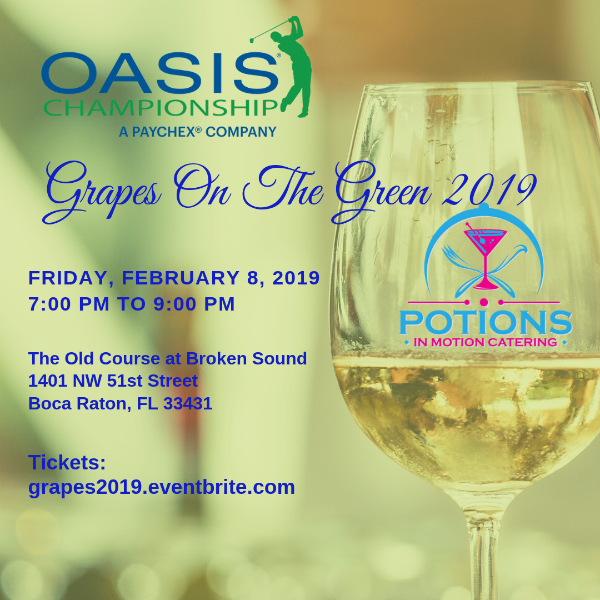 Join us Friday, February 8th from 7:00PM to 9:00PM for the 9th Annual Grapes on the Green at the NEW Oasis Championship! This year all the food samplings will be provided by Potions In Motion Gourmet Catering. Our Sexz Chef will present a Sexz Food Village featuring his most popular dishes! Something delicious for everyone. We will feature music and luxury sponsor tents! 2019 Wine / Spirit / Beer Sponsors. Dress for a casual cocktail party on the golf course. Wear appropriate shoes as the event will be on golf grass. Please note that the Grounds Pass is only available for Saturday or Sunday. We will present the pass to you when you check in.. Wear comfortable shoes and an umbrella is recommended just in case it rains.